This article is part of our special report Innovation and entrepreneurship. 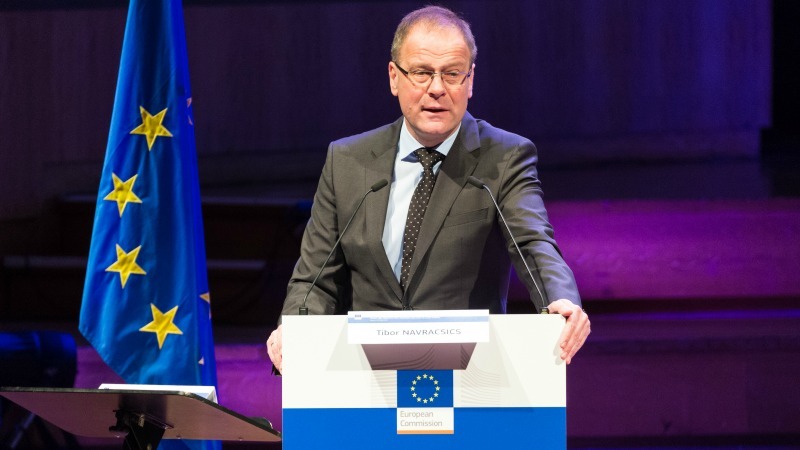 The beginnings of the European Institute of Technology (EIT), created in 2008, were “probably a little bit slow and complicated,” admits Tibor Navracsics, the Commissioner overseeing the EU’s flagship innovation agency. But things should be back on track soon, he told euractiv.com. Tibor Navracsics is the European Commissioner for Education, Culture, Multilingualism and Youth in the Juncker Commission. He spoke with EURACTIV’s Publisher and Editor, Frédéric Simon, ahead of the publication of a report by the European Court of Auditors which highlighted “inefficiencies” related to the EIT’s “complex framework”. I became familiar with EIT back in Budapest. Actually, as a politician I had some contacts with the EIT back then. The original idea was a very good idea. If we want to tackle our problems with competitiveness and Europe’s position in the global economy, then we have to put the emphasis on innovation, on bringing together stakeholders interested in innovation and competition. The EIT’s main profile was to establish ‘KICs’ (Knowledge and Innovation Communities), based on the knowledge triangles. I know that the initial funding period was probably a little bit slow and complicated, but now I think we are on the right track, the EIT has established five KICs so far, each of them managing very important issues from ICT to energy to climate issues. It is just speeding up and making more and more significant contributions to European competition. The Juncker Commission took €350 million from the EIT’s budget last year to fuel the European Fund for Strategic Investment (EFSI). This didn’t sound like a wholehearted endorsement for the EIT on behalf of the European Commission. What was the rationale behind the cut? It was a wholehearted endorsement, actually. Strangely enough the €350 million that have been cut can be seen as a sign of its success or at least of its potential. When we looked for financial instruments for financing the EFSI, we looked for points where future success and potential contribution from private partners could be easier and more profitable. In this sense, the EIT is an optimal meeting point of private capital and the institutions, in terms of academia and investor interest. That is why one of the priorities is education. For us, EIT is not just for competition, it is a member of the research and education family of the Commission. I think that is why it was an optimal point for investment even before the EFSI and now within the framework of it. In 2011, an independent evaluation of the EIT identified “inefficiencies” in the implementation of its mission and staff who were “ill-suited” to the job. The Court of Auditors is now expected to issue a report about the EIT in April. How much progress do you feel has been made since 2011 to address those problems? I’ve been in office for one and a half years, one of my first priorities was to make my two research institutes – the Joint Research Centre (JRC) and EIT – more visible, more transparent and more compact. That is why I am really looking forward to cooperating with the Parliament and Court of Auditors in improving the machinery of the EIT. Moreover, I established an expert group with highly respected professionals from five countries at the end of last year and it’s supported by the EIT governing board. We, together with the acting management of the EIT, opened a new chapter in the organisation and development of the EIT, because it’s interesting that while the professional performance is high in quality, when it comes to KICs, the administrative capacity sometimes lags behind. So I would like to see a more efficient and compact administrative centre and background, and we have the best hopes that in the near future, with the support of the governing board and the endorsement of the acting management, we will reach that goal. What kind of time frame do you put on this? When will those reforms start applying and bearing fruit? First, we will have a call for new management, as we have an acting management structure in place at the moment. It’s under way, the expert groups are working on the report, the governing board are in an intensive interaction with the expert groups. The reforms have been launched and the administrative reforms will be in effect in a few months. Are you confident about the Court of Auditors’ report? What are your expectations? I’m sure that the report will point out some of the past problems, but I hope that the auditors will support our reform steps. Last year, members of the European Parliament budgetary control committee refused to sign off on the EIT’s accounts for 2013. Many critics in the European Parliament believe the EIT has been too slow to deliver. What is your response to them? I can’t speak about how it was prior to when I took office, but we have a very good relationship with the Parliament’s ITRE Committee, which is chaired by Jerzy Buzek, who has been one of the staunchest supporters of the idea of EIT. They are supporting us in this new chapter in EIT. I think they were right: in the past, the administrative structure of the EIT wasn’t transparent enough and, probably due to the complexity of the first phase of the evolution of the KICs and EIT itself, we really missed out on tangible results. Now, we have tangible results. We are supporting start-ups, which can bring very innovative solutions and tangible results: smart thermostats, traffic and public transportation, driverless systems, and higher education programmes, are just some examples. I hope the MEPs are realising that there is an acceleration process happening in the EIT’s activities now. The chief executives of the five existing Knowledge and Innovation Communities (KICs) sent out a letter last September to the Commission. They complained essentially about two things: (1) Plans for shared accountability among participants in each of the five KICs; and (2) IP rights management, which the Commission wants streamlined, whereas before it used to be managed independently by the KICs. What are your answers to these concerns? Have they been addressed? Yes, we are in constant contact with them. This year, we are launching two more KICs so we are interested in learning from their experience. They were right, we have to clarify the lines of responsibility, because we want to develop synergies between the KICs. For instance, we have KICs on energy, raw materials and climate. Those KICs can work together far more efficiently to create even more comprehensive solutions for the future, so we have to clarify responsibilities. Intellectual property rights, however, are far more complicated, because we are working on the digital single market strategy. Plus, the creative industry, which belongs to my portfolio, is also very prone to intellectual property issues. We have to deal with these concerns and find solutions. How to you reconcile the wish of KICs to set their own arrangements when it comes to intellectual property (IP) rights and the Commission’s desire to see a more streamlined process? We have to find a good solution for that. But the solution won’t be to go backwards. At an elementary level, KICs are performing very well, so it is our duty to help them put together their knowledge, expertise and competencies, in order to find more comprehensive solutions, bringing them together through synergies. Of course, we have to clarify all the issues that might impede this. Looking ahead, two more KICs are going to be added to the current list: on food and added-value manufacturing. Can you outline the objectives of these two new initiatives? First on food, which is the most self-evident: Healthy food is one of the most important issues these days. So the food KIC will address the most important issues in keeping up a good level of production of high quality food. In terms of value-added manufacturing, it is another KIC which emphasises the importance of high quality, sometimes but not necessarily small-scale production, with an innovative profile. I think that this KIC will have a strong regional profile. There is a limit of 50 participants in the KIC, which is quite a significant number of companies or enterprises. I think a kind of innovative manufacturing can give an important economic profile to a region, where the participants of the KICs are. I hope it will be a really innovative phase of European manufacturing and that is why we will be funding these start-ups, entrepreneurs, ventures etc., that add to Europe’s competitiveness through innovation. Carlos Moedas recently announced the creation of a European Innovation Council. This has triggered worries that there could be a duplication of roles with the EIT. How will you both ensure that this doesn’t happen? The first safeguard is that I am very good friends with Carlos Moedas, so we can go to each other and solve problems very easily. The second, is that while the EIT gives institutional and educational support to entrepreneurs and the knowledge triangle, the EIC, as I understood, will be an advisory body of research activities outside the EU institutions. There are already strong links in place between that body and the JRC and EIT, even now. They will contribute to the EIC’s activities, providing advice where appropriate. I hope that they will be a natural institutional background to the functioning of the EIC. And the same will happen the other way round? No, as I understand it, the EIC will concern itself mainly with Horizon 2020 activities and they will investigate in some strategy issues for the future, while the EIT and JRC can bring knowledge, skills and experience underpinning their strategic opinions on these issues. The EIT will be subject to a review in mid-2017, spanning all aspects of its organisation. What are the main issues that you will be paying attention to? I would like to endorse EIT’s position among the top quality research and education institutions around the world. We, for example, have had very good results in education, for instance the Forbes 30 list. In terms of social innovators, we have five former fellows, institutes etc. on the list. The EIT’s KICs are well-respected and well known. So I would love to endorse those results. On the other hand, I would like to develop an even stronger profile on PhD and Masters courses. I would also like to see closer cooperation and collaboration within the EIT, between KICs, and externally, between the EIT and JRC. I would like to link them more closely together, because I hope that even better results could appear from that synergy. That is a pity. I would say that in the initial phase, that is a problem that can easily be cured. Yes, we need better visibility, probably a more unified brand of the EIT, with fundamental respect to the scientific research of the KICs, but when we negotiated with the European Investment Bank on future EFSI projects, they remarked that the whole structure of the EIT is so elusive, so blurred, that the streamlining process probably gives sharper contours to the whole institution. So you are going to continue in this direction in the coming years? How are you going to go about this? Again, mostly administrative tasks. We have to make the administrative centre more, I would say, PR-orientated or more visible. We have the traditional EIT “InnovEIT” Days in April, which is a good opportunity for showing off our results and putting the institution out there. We had, about two months ago, the first info days here in Brussels, which were very successful. Just like the JRC, which is coming out of the background of the Commission, the EIT will find opportunities where it can put itself into the limelight. Peter Olesen, the current director of the EIT board, told us in an interview last year that, in the end, assessing impact will be about whether the EIT has contributed to economic growth and job creation, as well as fostering a more entrepreneurial mindset in Europe. What metrics should be used in your view to assess the EIT’s success? What will happen if the objectives are not met? We can talk about measurements in two ways. The first is more direct: how many jobs have been created by the support or framework of the KICs? For instance, with the start-ups, a French start-up created 50 jobs. In indirect terms, there is the overall influence and shaping of the mood of the economic life of Europe. If you consider the 1,000+ master’s and PhD degrees that were undertaken within the EIT framework, its measurable influence is even more significant. So, I am optimistic, if we make the necessary steps in the coming months, in restructuring and making the administrative capacity more efficient, the KICs and EIT will be successful by 2017. A more personal question, if I may, on a completely different subject. Hungary, your home country, has been singled out by the Commission in terms of its management of the refugee crisis for re-instating border controls and erecting a fence. As a Hungarian and a member of the Commission, how did that make you feel? As a Hungarian: I love my home country. As a member of the Commission: we launched a new core within the framework of the Erasmus+ programme, which helps those NGOs and institutions that contribute to the integration of refugees, also online. But I am loyal to the Commission’s position. Do you think the criticism was fair? Was the Commission not overstepping its mandate? I’m now concentrating on education’s and culture’s contribution to the integration of refugees, trying to help the Commission and Hungary in coping with this crisis.